← Candied kumquats – like little oranges but better! In honor of Meatless Wednesday, I served a kale penne pasta. Enjoy! 2) In a pan (big enough to add all the veggie and the pasta) – sautee garlic, leeks and onion in olive oil with a 3-finger pinch sprinkle of salt until translucent and slightly caramelized. Add kale and stir. Pour a ladle-full of pasta water into the vegetables tenderizing the kale. Cook until most of the water evaporates, about 5 min in total. 3) Add the pasta to pan #2, toss to warm/coat pasta with the vegetables. Squeeze lemon/add zest and drizzle extra olive oil and stir again. 4) Right before serving, drizzle some truffle oil (I actually use a truffle-infused olive oil since the real stuff is pretty pricey) and serve hot. 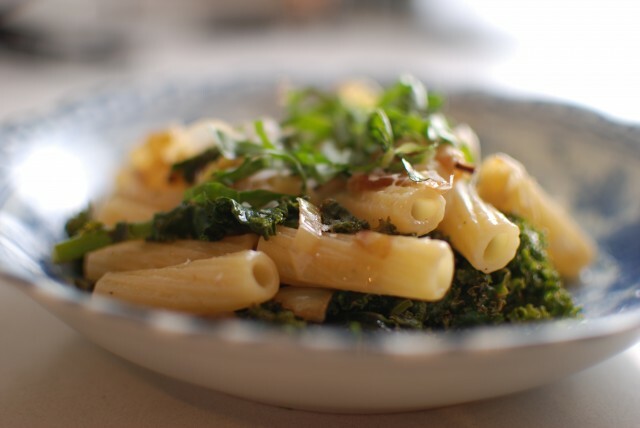 This entry was posted in becoming a chef, Chef Kelly and tagged healthy meal idea, kale, kale pasta, kale penne pasta, leeks, meatless, meatless wednesday, quick and easy dinner, truffle oil. Bookmark the permalink.